” I am writing this letter in absolute gratitude for what the product, BAC, has done for me. When I started taking BAC F2, it was because my sister, realizing the tremendous state of poor health that I was in, ordered it for me. I began taking it, one half of a capsule at a time. I saw no real response to it, and stopped taking it. Months passed before I would try again. Chris finally convinced me to start taking the product once again, and this time I made a commitment to follow through taking it. I am now up to five capsules a day. It has been about four months, and during this period, I have experienced some phenomenal things. First, I was suffering with Irritable Bowel Syndrome. It is gone. Next, I was suffering with arthritis. It is much better and I believe on its way out. Thirdly and most importantly, I was suffering with scarred and damaged lungs from having been stricken with Staphylococcus Pneumonia in 1998 and ARDS in 2000. Both deadly infectious lung illnesses that kill most people quickly. I was on life support both times, in a coma both times, tracheostomy in my throat both times and pronounced dead both times. I was told I would be on oxygen the rest of my life. I had no wind in me, and breathing was difficult. Pigments are colorful chemical compounds which reflect only certain wavelengths of visible light. This makes them appear “colorful”. Flowers, corals, algae, even animal and human skin contain pigments which give them their colors. More important than their reflection of light is the ability of pigments to absorb certain wavelengths. Scientists have identified at least 600 such pigments and many more are to be identified. Because they interact with light to absorb only certain wavelengths, pigments are useful to plants and other autotroph organisms which make their own food using photosynthesis. 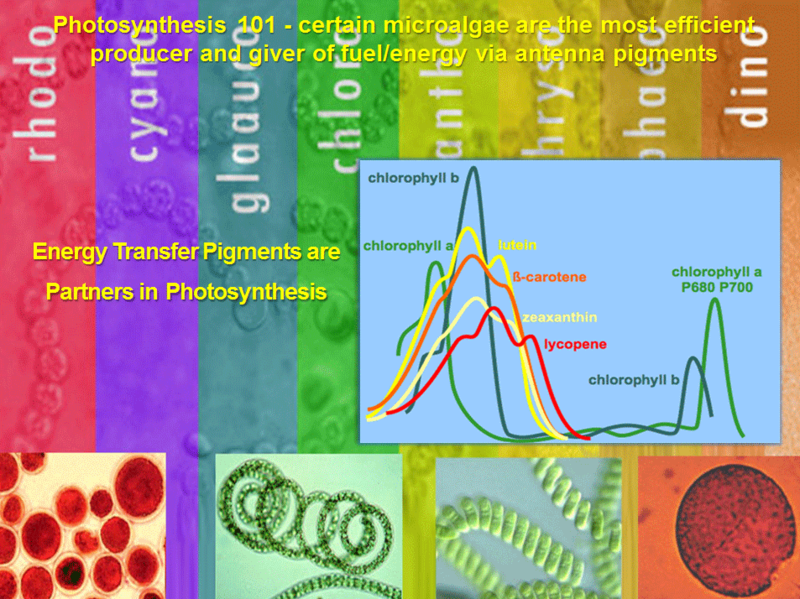 In plants, algae, and cyanobacteria (blue-green algae), pigments are how the energy of sunlight is captured for photosynthesis. However, since each pigment reacts with only a narrow range of the spectrum, there is usually a need to produce several kinds of pigments, each of a different color, to capture more of the sun’s energy. There are three basic classes of pigments. Chlorophylls are the most important chelates in nature. They can channel the energy of sunlight into chemical energy through the process of photosynthesis. 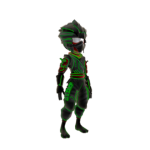 Chlorophylls are greenish pigments which contain a porphyrin ring. This is a stable ring-shaped molecule around which electrons are free to migrate. Because the electrons move freely, the ring has the potential to gain or lose electrons easily, and thus the potential to provide energized electrons to other molecules. 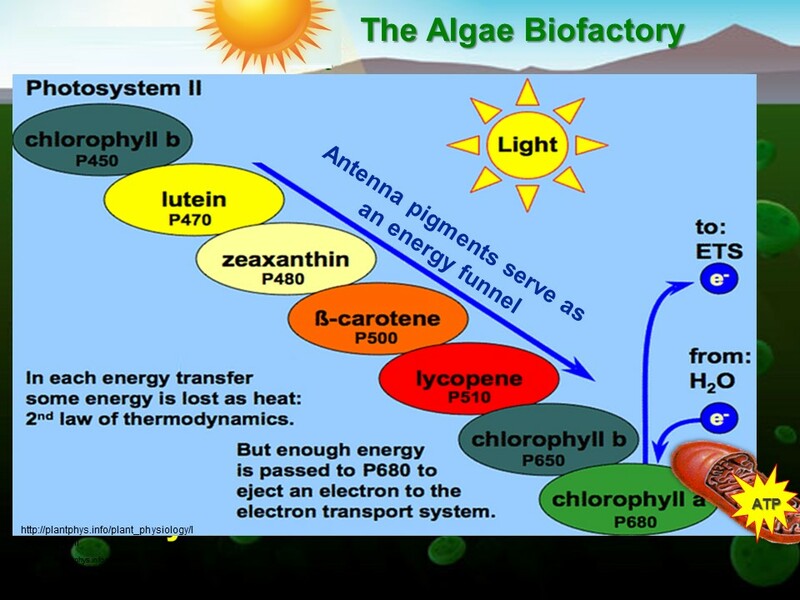 This is the fundamental process by which chlorophyll “captures” the energy of sunlight. Carotenoids are usually red, orange, or yellow pigments, and include the familiar compound carotene, which gives carrots their color. These compounds are composed of two small six-carbon rings connected by a “chain” of carbon atoms. As a result, they do not dissolve in water, and must be attached to membranes within the cell. 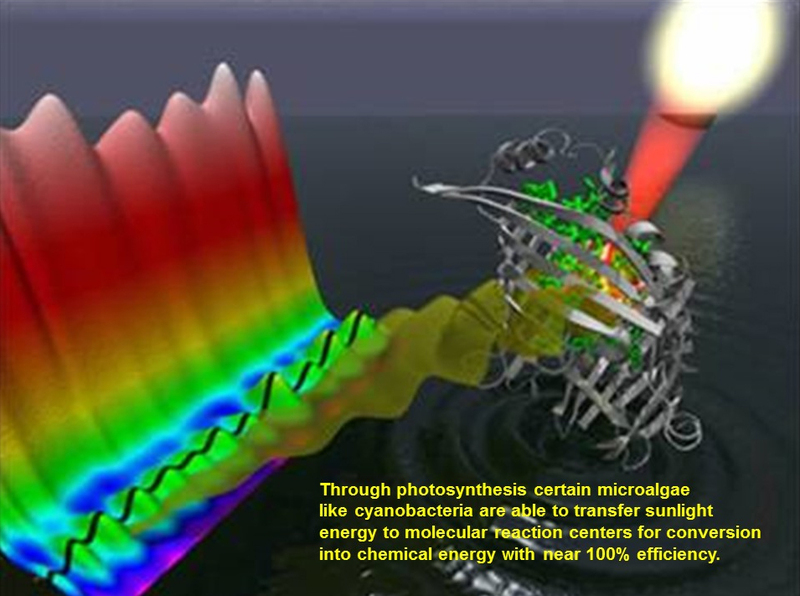 Carotenoids cannot transfer sunlight energy directly to the photosynthetic pathway, but must pass their absorbed energy to chlorophyll. For this reason, they are called accessory pigments. One very visible accessory pigment is fucoxanthin the brown pigment which colors kelps and other brown algae as well as the diatoms. Phycobilins are water-soluble pigments, and are therefore found in the cytoplasm, or in the stroma of the chloroplast. They occur only in Cyanobacteria (blue-green algae) and Rhodophyta (red algae). Phycobilins are water-soluble pigments, and are therefore found in the cytoplasm, or in the stroma of the chloroplast. They occur only in Cyanobacteria and Rhodophyta. The picture above shows the two classes of phycobilin which may be extracted from these algae. The vial on the left contains the bluish pigment phycocyanin, which gives the cyanobacteria (blue-green algae) their name. The vial on the right contains the reddish pigment phycoerythrin, which gives the red algae their common name. BAC contain both blue-green algae and red algae to take advantage of the extraordinary benefits of their pigments. Phycobilins are useful to the organisms which use them for soaking up light energy. Both phycocyanin and phycoerythrin fluoresce at limited wavelengths. That is, when they are exposed to strong light, they absorb the light energy, and release it by emitting light of a very narrow range of wavelengths. These pigments chemically bond to antibodies and are found to prevent tumorigenesis. BAC is a whole food. The selection of algae in BAC make up for an extraordinary offering of pigments and their resulting health benefits. BAC contains many yellow/orange/red/blue/green pigments from which pro and pro-pro-vitamin A can be made. 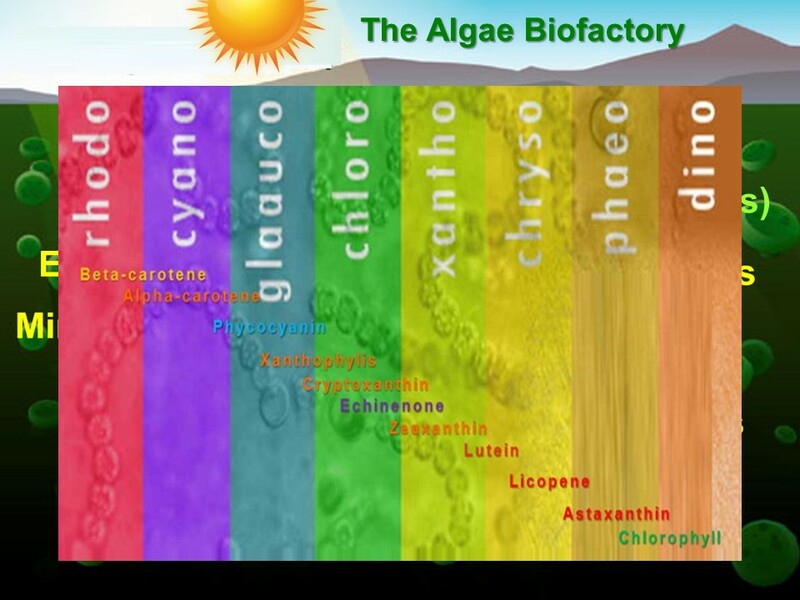 The four algae in BAC ; spirulina platensis, spirulina pacifica, dunaliella, haematococcus, together comprise a broad spectrum of light-life giving pigments. These and several lesser pigments such as phycoerythrins, tetrapyrroles, phytonadiones and carotenoids are not just the “color” of living organisms, but are used to carry on metabolic processes throughout the body. Without them, enzymatic reactions would be reduced until cellular disintegration occurred. The green algae of BAC are rich in phycobilins and the richest sources of chlorophylls which contains high levels of magnesium for photosynthesis, and calcium spirulan, a well-known agent for its antibacterial, anti-fungal and anti-inflammatory benefits. BAC’s red algae haematococcus and dunaliella contain high levels of nature’s special pigments carotenoids and phycobilins. The astaxanthin, beta carotene, alpha-carotene, lutein, lycopene, quercetin, b cryptoxanthin and many other pigments found in BAC offer powerful immunity and toxin shield against continuous pollution, toxins and stress. Haematococcus, the source of astaxanthin found in BAC is the highest known source on earth. Astaxanthin is a red pigment clinically proven to have hundreds of times more antioxidant power than vitamin E and vitamin C, and dozens of times more than that of beta carotene as found in carrots.